Observational data is a valuable form of research that can give researchers information that goes beyond numbers and statistics. In general, observation is a systematic way to collect data by observing people in natural situations or settings. There are many different types of observation, each with its strengths and weaknesses. Looking to assess your project’s impact? Get started with this ready-to-use survey template. Participant observation is when a researcher is involved in the activity they are observing. For example, the researcher is a participant in an Alcoholics Anonymous group, and they are observing something about that group. In non-participant observation, the researcher is separate from the activity (for example, an adult in the back of the classroom observing students’ test-taking skills). Both participant and non-participant observation have strengths and weaknesses, depending on the study and the observational data looking to be collected. Participant observation offers the researcher more context and a greater understanding of what’s being studied. However, participating in the activity can change the behavior of those being observed. By the same measure, non-participant observation allows researchers to use tools like recorders or cameras to more accurately capture what is being observed, but it may provide more limited insight into the dynamics and context of what is being studied. Participant observation offers the researcher a greater understanding of what’s being studied. However, it can change the behavior of those being observed. Both participant and non-participant observation can yield valuable or detrimental observational data, depending on your study. However, they are often most effective when used together to develop a more complete picture of what’s being studied. For example, a researcher who wants to study competitive chess players could first watch chess tournaments from the stands (i.e. non-participant observation) to get an overview of how the players interact. Then the researcher could participate in the chess tournaments (i.e. participant observation) to directly interact with the chess players and learn more about the community’s motivations and internal dynamics. Simple observations are often numerical, like how many cars pass through a given intersection each hour or how many students are asleep during a class. Behavioral observation, on the other hand, observes and interprets people’s behavior, like how many cars are driving dangerously or how engaging a lecturer is. Simple observation collects simple numbers. However, it doesn’t account for why those numbers might be. The value of simple observation lies partly in its name – it collects simple numbers that researchers can use to easily calculate trends or averages and provide clear numerical evidence. However, simple observation doesn’t account for why those numbers might be. Behavioral observation can be very valuable in terms of contextually understanding certain numerical trends, but it does leave a lot of room for researcher bias or subjectivity. Like participant and non-participant observation, both of these forms of observation are most valuable when used together to understand details within a bigger picture. For example, a researcher may combine simple observational data (how many people attend a workshop) with behavioral observational data (how actively people participate in the workshop) to assess how effective a workshop is. Even seasoned professionals are susceptible to researcher bias — errors due to bias and mental shortcuts. Watch out for these shortcomings that can discredit even the most well-designed surveys. While they can seem similar, direct and indirect observation have important methodical differences. Direct observation is when the researcher is observing an activity or process while it’s happening (e.g. they are watching students in the cafeteria at lunch to learn about their eating habits). In contrast, indirect observation involves the researcher observing the results of an activity or process after it happens (e.g. they examine the trash left over after students’ lunches to learn about their food waste habits). While they are very similar, direct and indirect observation occur at different times during the study and, more notably, offer different relevant information to the researcher. Direct observation is valuable because it offers real-time information. Its weakness, however, is that it misses anything outside of the observation. Direct observation is valuable because it offers real-time information about what is being studied. Its weakness, however, is that it misses anything outside of the observation (e.g. it doesn’t account for how students eat outside of lunch or outside of the cafeteria). This means that direct observation only offers information about a part of the bigger picture. Direct observation can also be prone to bias and inaccuracies, since people often behave differently when they know they are being observed. The value in indirect observation lies in the fact that it is non-invasive and people’s behavior will not be affected by the presence of an observer. Its weakness, however, is that information collected could be limited depending on what is being indirectly observed. Covert vs. overt observation has arguably the most noticeable difference in the role the researcher plays in the process. Covert observation takes places when a researcher is observing the activity in secret (perhaps through a hidden video camera). In overt observation, as the name describes, the people being observed know a researcher is observing them. As with the other methods, there are obvious strengths and weaknesses of both forms of observation. An advantage of overt observation is that it lets researchers be honest with participants and tell them they’re being observed. This avoids any ethical issues, like the lack of informed consent. However, a related disadvantage is that the participants understand the aims of the observer, so they’re more likely to alter their behavior. Overt observation avoids any ethical issues. However, the participants are more likely to alter their behavior. As hinted at above, covert observation raises immediate ethical issues (since people involved in a study should give informed consent first). However, covert observation allows researchers to access groups that otherwise would not participate in studies, allowing researchers to expand knowledge on lesser-known social groups. 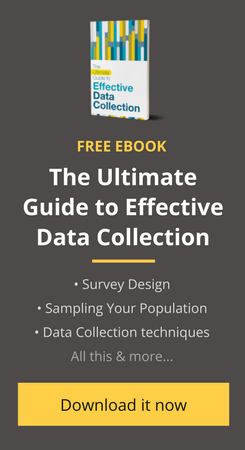 Should You Collect Observational Data? All of these methods of observational research have strengths and weakness. Whether you choose to use observation and how you choose to carry it out should be thoughtfully chosen, depending on your study. Below is a list of pros and cons for collecting observational data. Check it out and see if observation is right for your next study! Observation lets researchers view and test a hypothesis in the real world, making it less hypothetical than other data collection methods. Observation allows researchers to create and observe actual situations. For example, instead of using data to try and predict what will happen when consumers pass a large product display, observation can gather actual results. Observation is ideal for situations in which nonverbal communication is important for complete research. Observation provides a more reliable measurement of actual behavior than self-reported metrics. Observational research can include a high degree of researcher bias — the observer is human, and his/her subconscious opinions or biases can affect the analysis. Observation can be heavily dependent on interpretation. Since a researcher cannot “see” attitudes or thoughts, it can be difficult to do accurate analysis on why people do what they do from observation alone. Some forms of observational research don’t always return an accurate demographic sample. For example, researchers are sometimes left at the mercy of whoever was available while the study took place, whether or not that lines up with the larger population. Observation often only tells one part of the story. Observing actions tells a researcher what people choose to do, but it doesn’t tell why they chose to do it.